Claber manufacturing process makes recycling of raw materials that much easier. Claber uses moulding technologies that require less raw material, so there is ultimately less material to be disposed of or recycled. 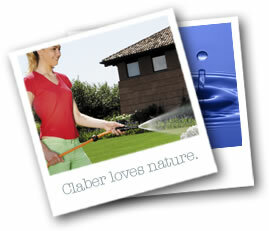 Production waste is recycled by Claber, using internal or outside resources. Claber leads the way in sorted waste collection. Long before the sorted collection of waste became mandatory, Claber had introduced a system of separating waste materials (cardboard, metals, aluminium, etc.) to facilitate their recycling or disposal. In addition, all components of Claber products bear standard international symbols indicating the type of material, to assist sorted collection. For over 15 years, the company has been using polyethylene terephthalate (PET) for its blister packs: PET has a low impact on the environment, as it is easily recycled. What is more, Claber packs are made as compact as possible, using as little material as possible, so as to facilitate disposal and recycling still further.